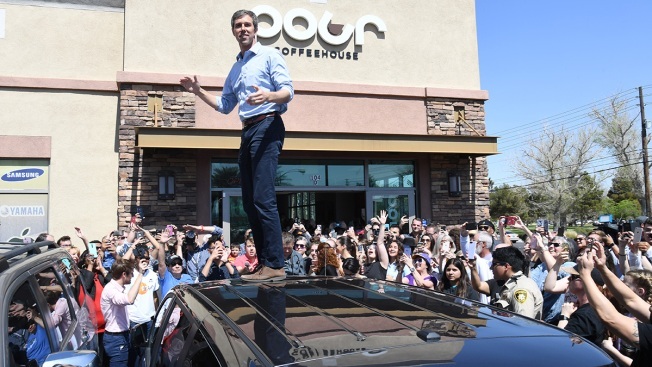 Beto O'Rourke raised more than $9 million during the first 18 days of his campaign for president, his campaign announced Wednesday. According to the campaign, O'Rourke raised an average of $520,000 per day from 218,000 contributions "without taking a dime from PACs, special interests, lobbyists and corporations. "In just 18 days, people in every state and from every walk of life have organized in homes, contributed a few bucks online and united together to show that the power of people is far greater than the PACs, corporations and special interest that have captured, corrupted and corroded our democracy for far too long," said O'Rourke. "Not only is this a sign of our grassroots strength during the first two weeks of our campaign but it is a sign of what's possible when you put your full trust in the people of this country." Though continuing to rely on small-dollar donations, O'Rourke's campaign raised $9.4 million in that 18-day time period. According to the campaign, 98% of the contributions were below $200 and 99% of the fundraising was received online; The average donation, the campaign said, was $43. The campaign also said the majority of the donors during that 18-day period were new donors who did not previously donate to O'Rourke during his bid for U.S. Senator. O'Rourke, meanwhile, is returning to Iowa for four days where he'll take part in nearly two dozen events. The trip to the Hawkeye State will be his second since announcing his bid to run for the White House last month.